NEW FOR 2017 35 x 12 Two bedroom sitting on edge of sea loch. Our 2nd time here and it’s really a stunning place to stay to use as a base to explore the Highlands and Islands on the West coast of Scotland..10/10 for everything and we will continue to stay here as it’s perfect. A great week in a superb place. We've been returning for the last few years and we will go again. The caravan is in good condition, very warm with a good shower. Thank you for a lovely stay. Excellent week in and around Appin, just what the Doctor ordered, lovely spot, great for getting around, lots of nice food and drink to get at. Could have done another few days but have to get back to reality. Booked a week in Caravan J, what a view from the window, just perfect. Very comfortable bed, basic provisions catered for, crockery etc. Shower was great, enough space for mine & my husband's clothes. Great electric fire, very modern electric fire ,would take the chill off first thing in the morning & late at night. Ideal spot to visit surrounding area. An area to recycle plastics, etc, great facility. Would highly recommend, hope to return one day & stay in the Lodges. The location is an absolute delight. We were lucky with two weeks of glorious sun. Watching the light change on the loch with the movement of the late night sun became almost an obsession. Picturesque. Highly recommend this website. The owners couldn't do enough to make our stay enjoyable. Thank you. We both thoroughly enjoyed our stay in caravan J. It had everything we needed and was in an excellent position at the side of the loch. Very enjoyable stay at Appin Holiday Homes. We stayed for two weeks. First week in a lodge. Second week in the caravan. The owners allowed us to pack our bags and leave them in the lodge hallway along with an almost full fridge. Whilst we went out for the day. On return to our caravan for our second week, all our belongings and fridge items were safely in there. Very good service. And would like to stay again in the future, lots to see and do. Caravan was very comfortable and well appointed. It was in a very good location right on loch with great views. Owners were very helpful. chairs on the verandah, sadly needing a coat of paint/varnish. This was the first time we have holidayed in a static caravan and it was a great experience. The location is superb, immediately by the loch side and lovely to be able to look straight out of the caravan on to the loch. The general location is also very good in terms of visiting this part of Scotland as many areas of interest are within easy reach and, although we didn't have a chance to explore them, there are many local walks nearby with information provided on site. We also noted what looked like a good network of cycle routes as well. The caravan we stayed in was very comfortable and well provided for. Jim came to check we had settled in ok and was very approachable and there was a friendly atmosphere to the place. We booked one of the older caravans because it was a late booking and one of the only vans left. That said it was very pleasant, clean and comfortable inside, albeit showing some signs of its age now. The location was delightful, perched right above the beach with beautiful views of the loch. The vans are well spaced and there are only 8 so we had plenty of peace and quiet. I can't comment on the service because we had no need to call them. Lovely comfortable caravan J by the loch and great location to visit places between Oban and Fort William,Creagan Inn nearby that has a beautiful view and meals. The caravan is spacious and well equipped,good storage and great views of the loch also great for families with use of games room. Plenty of places of interest to visit i.e castles,wildlife,woodlands walks and activities. We have stayed for 3 days. The weather was a little bit cold but Gasfire was very helpful.we have enjoyed very well.location was great.we went to Oban by car.it's not far...wonderful place. Caravan ok a bit grubby in the kitchen area. Only one pillow per person supplied. Did not state that parking at the caravan was not available. Location stunning! We are sorry you were disappointed with your stay. However parking is provided at the caravan park just not directly beside the vans as this spoils the view! This caravan is an older model as stated on our website but has a stunning location and the price reflects the age. Great stay, your are to fell so welcome and nothing's to much. Been 3 time in 6 weeks and love every stay. so relaxing with loch creran in front of you. Not to far from oban to great location. Highly recommend a stay here. We had a lovely relaxing weeks holiday. We were very lucky with the weather, it was beautiful everyday. Any problems we had eg when the light went out on the boiler Jim came to sort it out straight away. great caravan park for canoeing and kayaking. Been there twice and will be back next year! Owners are extremely helpful and very friendly. Can't fault anything !
. The location of this caravan park was ideal for us. Super for cycling as the cycle route goes right passed the site - no need to cycle on the road. We were also a few minutes cycle from the Creagan Inn which does great pub food. The caravan was great value for money and the owners very helpful when needed but leaving you to get on and enjoy your holiday in peace. Lovely quiet site. Stayed here in May 2015 and could not fault the location. The caravan sat facing, and almost on the loch with terrific views, there was a pub about 600 yards from the site, (the Creagen Inn) which was easy to walk to and the food served was of very good quality and price. The caravan we had (caravan J) was quite dated and had no heating of any kind in the bedrooms or the bathroom which made it very cold at night, especially when the wind blew and this made our stay a bit uncomfortable for 4 of the 7 days we stayed but not overly off putting. The whole of Argyll and Bute, and indeed the whole of the north west of Scotland has some terrific scenery and this caravan site is very well situated to take advantage of this with only a 20 minute drive to Oban, 35-40 minute drive to Fort William, 20 minute drive to Glencoe and the best drive of all about 1hr 45minutes to Mallaig. There are plenty of sports, walking, climbing, fishing, boating, horse riding, water sports and boating but if you only want to relax, then the location is perfect for this too. All in all, a great time was had on this holiday and would definitely recommend Appin Holiday Homes to anyone, just remember to ask about the heating, after all, this is Scotland. Thank you so much for the lovely review on your holiday with us we are really pleased you liked the caravan and site. Just returned from a fabulous weekend in Caravan K at Appin Holiday homes. Very satisfied with all aspects of our break. 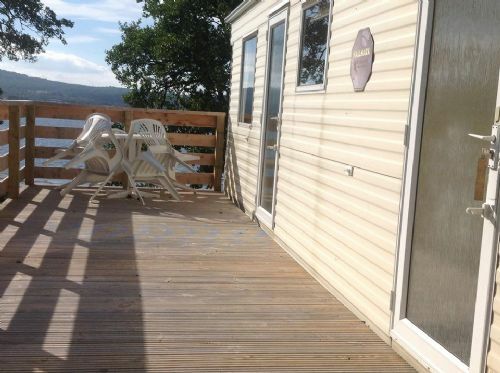 Lovely setting, lovely caravan with fabulous views and very well kept surroundings right by the waters edge. Very helpful and friendly owners. Will return. Thanks to all. What a stunning location. Right on the Loch and a brilliant base for touring the west coast. Caravan was spotlessly clean and lovely and warm. Great inn five minutes walk away if you fancied a tipple or meal. We will definitely return. We had a fantastic time at the loch! The caravan site is amazing! The caravan faced the loch and had the most amazing view! We could launch our canoe straight from the caravan and could see seals in the lake! Fishing, paddling, open fire on the beach.... Anything you wish for a camping holiday! The loch-side location is stunning - watching the loch wildlife (including seals!) from the comfort of the sofa was wonderful. Jim & Julie, the owners are lovely, and very helpful. In fact when we first arrived, we used the microwave, and it gave off an electrical smell, so we mentioned it to Jim, and it was exchanged within 5 minutes! Midges were a nuisance, and although they don't bite if you use repellent (Boots' 50% Deet is good) we felt a bit stuffy in the caravan, as you can't open the windows without them coming in. Mozzie mesh on a couple of windows would have been a real help. Oh, and a minor thing that we meant to mention to Jim when we there, the tin-opener was a bit knackered. I had to use my pen-knife.